BERWYN, Pa. -- Police say the Chester County man behind the wheel of a car that flipped over into a pond, killing himself and his brother, was nearly five times over the legal limit. Investigators said on Tuesday that 52-year-old Thomas McAleer had a blood alcohol content of .398, far exceeding Pennsylvania's legal limit of .08. State police added that McAleer's system also had the presence of THC, the active ingredient in marijuana, along with other drugs. The crash happened at 4:36 p.m. on Friday, October 2nd on Glenn Avenue, south of Lancaster Avenue, in Berwyn. Police say the road was wet from recent rain at the time. 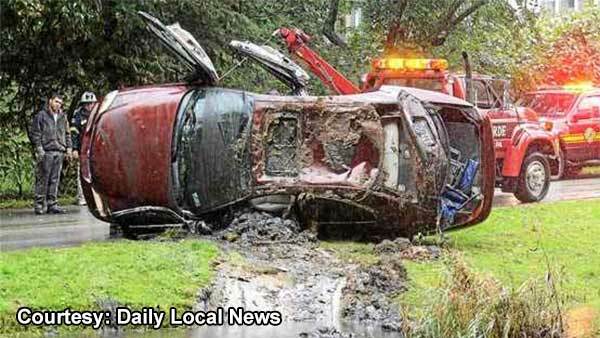 Witnesses told police the car left the road and landed upside down in a pond. Thomas McAleer and his brother, Michael, drowned.